Chinese General Yang Sen wrote a report about him, "A Factual Account of the 256 Year-Old Good-Luck Man. ", where he described Li Ching Yuen's appearance: "He has good eyesight and a brisk stride; Li stands seven feet tall, has very long fingernails, and a ruddy complexion." He claimed to have learned about longevity from another Daoist he met on the Emei Mountain in Sichuan province near the Tibetan border. This monk, according to Li, Ching-Yuen's story, was well over 300 years old, was as agile as a monkey, as strong as a tiger and as wise as a dragon. 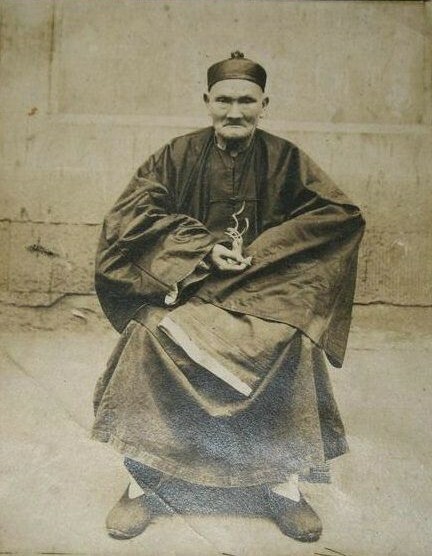 This ancient Daoist sage reputedly instructed Li, Ching-Yuen in his secret method of health nourishing martial art exercises based upon the wisdom of the Book of Changes (Yijing). Most likely this was a Daoist of the Long-Men sect who practiced a method of circle walking meditation combined with chanting and visualization. The art of Li, Ching-Yuen came to be known by the Li family as Jiulong Baguazhang (Nine Dragon Eight Diagram Palm). In 1927 Li Ching-Yuen was invited to Wann Hsien, Szechuan by General Yang Sen who was fascinated by Li's remarkable youthfulness, strength and prowess in spite of his advanced age. The enclosed photograph was obtained there. After Li's death, the General investigated his background to determine the truth to his claimed background and age, which led to a report that was later published. Returning home, he died a year later, some say of natural causes, while others claim that he told friends, "I have done all I have to do in this world. I will now go home." With these words he lay down upon his couch and allowed his spirit to depart through sheer willpower. An interesting sidelight to the above story was thrown upon the unique properties of fo-ti-tieng (Gotu Kola) by a 107 year old Indian sage named Nanddo Narian, who claimed that the herb provides the missing ingredient in a man's diet, without which, he can never control disease and decay. He found it to be, in practice, the finest of all herbal tonics and nutrients. The results of the studies performed upon Gotu Kola by the French in Algeria revealed what appears to be a new vitamin not known in any other food or herb. It was described as the "youth vitamin X" that exerts a rejuvenating influence upon the ductless glands, the healthy functioning of which is, the means by which the brain and body are maintained for healthy activity.